Yesterday, I volunteered at the 27th Annual Benefit Gala of The Drama League at the Pierre Hotel. This was the second year in a row in which I took a day off from my job to take part in the event and it was well worth it. It involved assisting with preparing gift bags for the patrons and set up of the silent auction tables. There were around 40 volunteers at this year's event. It's not all work though - the camaraderie of this organization and its volunteers is fantastic and we, as volunteers, dressed up to the nines for this black tie event and also attend the gala performance. I assisted at the second registration table on the 5th Avenue side of the Pierre Hotel - it's a lovely setting and it was fun seeing all of the attendees looking so glamorous. I enjoyed greeting Patti, who looked smashing in a flattering, understated black gown. I also checked in John Doyle and William Ivey Long. Once we were released from our duties, we were able to enjoy the gala performance. This year, the Drama League Gala Performance was for Broadway star Patti LuPone. Performers gathered to put on a show for her that celebrated her musical career - partly a roast, partly an appreciative celebration, all loving. My friend Ronni, whom I met at last year's gala, and I had excellent seats - we were immediately behind the Callaway family, while Laura Benanti and Justin Guarini were seated next to me for a while and then switched out with Marc Shaiman and Scott Wittman. It was fun sitting with them - all were enthusiastic audience members and great, loud laughers. When Patti's around, you get a good dose of the bawdy and last night was no exception. The first notes heard were not live, but from Patti's own recording of "Don't Cry for Me Argentina" from Evita. Four scantily clad boy dancers entered and were joined by Christopher Sieber in a satirical medley of songs from Evita. This would be the only Evita heard during the evening, despite it perhaps being the beginning of Patti's legendary career. Throughout the evening, Chris would continue to entertain the audience with readings from Patti's recent autobiography, Patti LuPone: A Memoir . 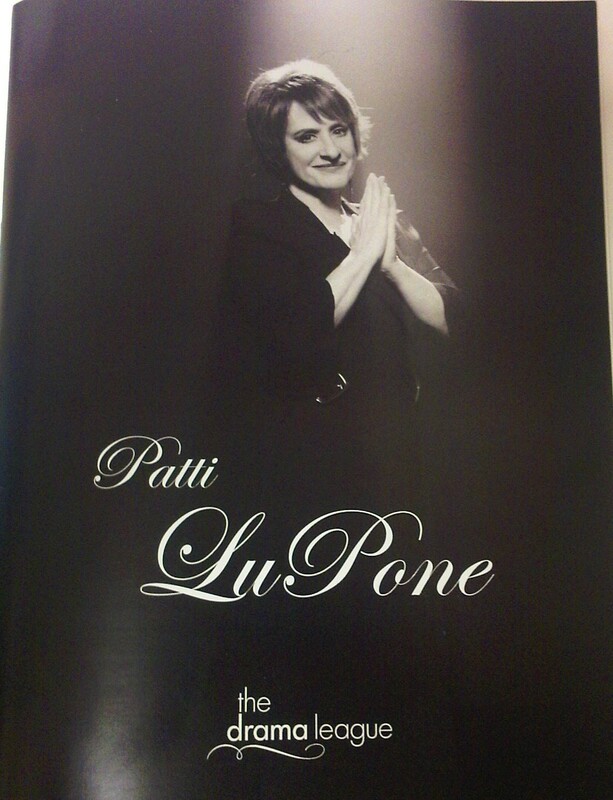 These readings also were offered by the voice of Patti herself via the audiobook . These were met with much laughter, although sometimes it sounded a bit nervous with Patti right there in the room. Chris also shared his own anecdote of being a very green Broadway performer at 24 years old and playing Frank against Patti's Annie in a reading of Annie Get Your Gun...I paraphrase when I tell you that it was an orgasmic experience for him. It wasn't all fun and games, as some of the tribute was lovingly rendered. Performers Justin Guarini, who recently played Patti's son in the musical, Women on the Verge, sang "As Long As She Needs Me", Emily Skinner sang "Sleepyman," and Liz Callaway sang "Meadowlark." Ann Hampton Callaway sang "I Get A Kick Out of You," the song she auditioned with for a part that Patti got. This was perhaps the best rendition of this Cole Porter tune ever, complete with scatting! She then went on to compose one of her signature on-the-spot songs tailored for Patti from words suggested by the audience - my favorite line: "When I saw you play tuba in Sweeney Todd, I knew there was a God." Now that's poetry. Frequent co-star Audra McDonald performed "A Parade in Town," from Anyone Can Whistle. Chris Burke, Patti's son "Corky" in the television series Life Goes On also showed his appreciation in a lovely written tribute. Patti shouted out her appreciation back to him, "I love you Chris!" It was very sweet to see a middle-aged Corky. More parody came from the "North Port Patti LuPone Memorial Glee Club" made up of Nick Adams, Chad Kimball, Will Chase, Daniel Reichard, and Montego Glover. They paid tribute to Patti's regional and concert work at Ravinia, the New York Phil and Encores by singing a hilarious mash up of Annie Get Your Gun, Sweeney Todd, A Little Night Music, Sunday in the Park with George, and others. Marc Shaiman and Scott Wittman performed a re-write of Cole Porter's "You're the Top" - it was very funny and very sweet. Patti's fellow Gypsy co-stars Laura Benanti and Boyd Gains performed re-write of "Everything's Coming Up Patti" and "Together," and brought a card-board cut out of Patti to round out their trio - things really got bawdy here with Boyd spending a little too much time with card-board cut out Patti. The musical finale of "Blow Gabriel Blow" was performed by James Monroe Iglehart, who was joined onstage by a 90 member chorus. Patti was singing along from her seat at the table of honor. This was a joyous performance and had the whole room singing and clapping along. Vanessa Redgrave took the stage to present Patti with the Drama League Award. After speaking a few words of admiration, she said that other than the lines of Driving Miss Daisy, she has two other pieces memorized - As You Like It and the poem Everybody Sang by British poet Siegfried Sassoon, which she chose. Orchard and dark-green fields; on; on; and out of sight. We were treated to one last special moment when Audra McDonald joined Patti, Vanessa, et al. on stage, she said, "We can't end the evening without hearing a song from the Short One." Patti proceeded to take a lyrics sheet out of from her bosom and joined in singing "Come On, Get Happy" - she threw the lyrics over her shoulder as they proceeded to blow the roof off of the Pierre. It could not have been more thrilling! The show and the special lyrics were written by Stephen Cole. Other special material was written by Scott Wittman and Marc Shaiman. The show was co/directed by Cady Huffman and Roger Danforth. Cady also served as choreographer. Roger Calderon coordinated the event. Gabriel Shanks is the Executive Director of the Drama League. Proceeds from the gala will fund The Drama League’s Director’s Project. It is a program that aids young directors to assist well-known director, as well as stage their own productions during a festival in New York. A service organization, the Drama League was founded in 1916 as a club and is now the premier association funding enhancement projects for theatre and its audiences. This is beautiful — thank you for sharing in such glorious detail. I hope you stole that cardboard figurine. The life you lead, SarahB! I love this post. And they would be a fool not to have you back next year to help out. Maybe even perform! Wow Sarah, this sounds like a very special night! How cool that you were there. Thank you for this recap. I am glad to know what went on there. Some of the jokes—especially the audiobook soundbites—sound like they could have been a little awkward. I hope there was booze, haha! 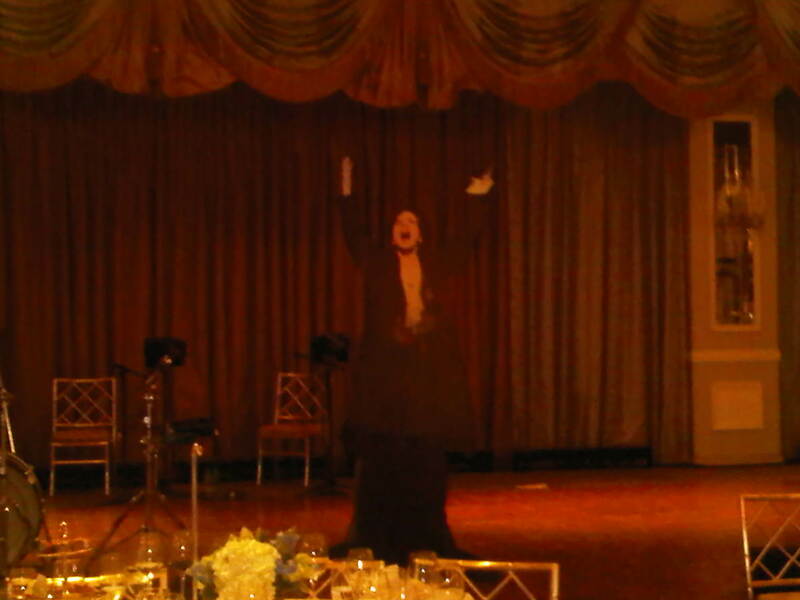 Sarah, this is a great review of the gala and really made me feel as though I was there (even though I wasn't). Thank you for sharing this!